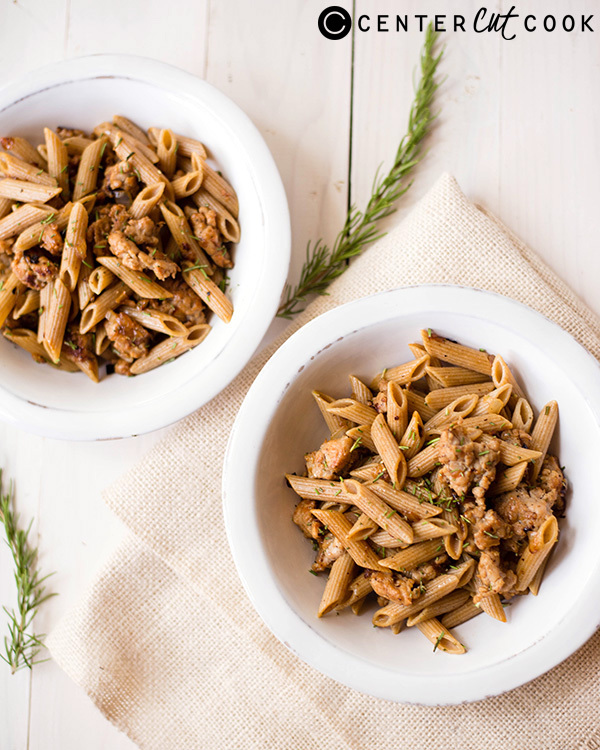 This chicken sausage pasta is delicious, filling, and still healthy for you. 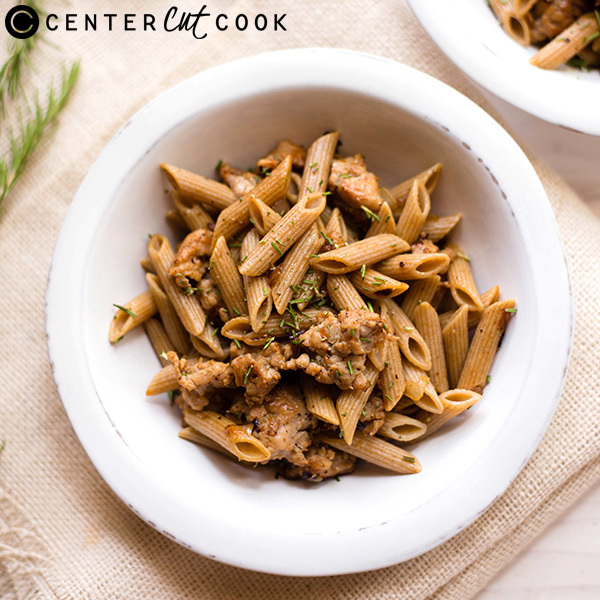 This pasta uses chicken Italian sausage and whole wheat penne noodles and has a freshness from the minced rosemary. One of the biggest struggles I’ve had with trying to live a cleaner, healthier lifestyle is that I have to give up things I love…like pasta. Not today, sir. 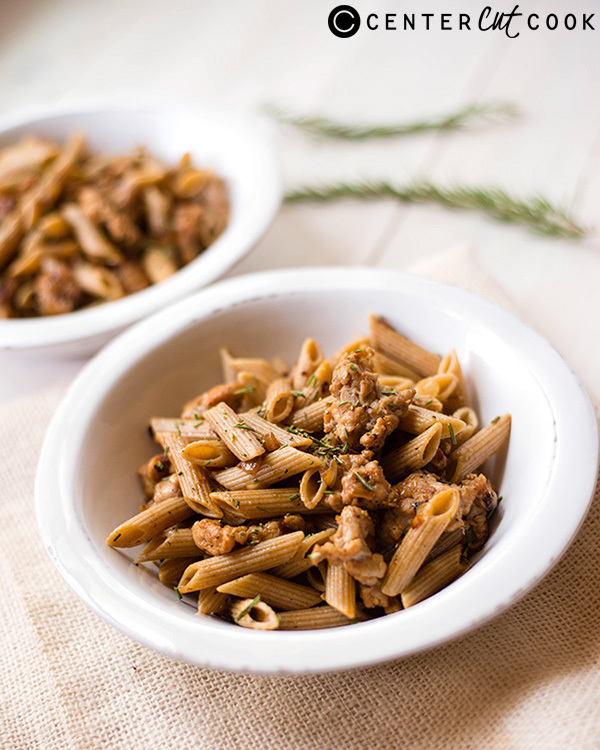 This pasta uses whole wheat pasta and replaces regular pork Italian sausage with chicken Italian sausage. Plus, it doesn’t use any butter or cream and, instead, uses olive oil and fresh rosemary. All in all, this is one pasta you can eat and still enjoy your healthy lifestyle. Sweet! The trick is to focus on replacing the main unhealthy ingredients with healthier ones and not to overdo any carb or fat in your meals. 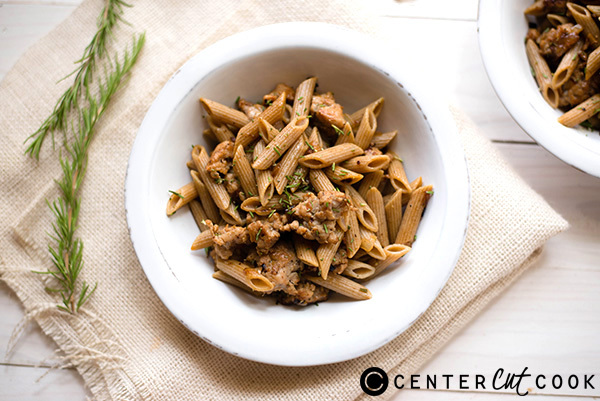 If you can’t find chicken Italian sausage, you could substitute ground chicken and toss in a few fennel seeds to kick up the flavor a bit. Heat a deep stock pot full of water over high heat and add the salt. Once boiling, add the pasta and cook until al dente (almost fully tender, but still with a bite), about 8 minutes. Heat the olive oil over medium-high heat in a large skillet. Add the onion and pepper and cool until starting to sweat, about 5-6 minutes. Add the ground Italian sausage and cook until well-browned, mixing with the cooked onions. Once browned, add the garlic and cook for one more minute, until the garlic is fragrant. Transfer the cooked pasta from the pasta water into the skillet and stir to combine everything. Add the minced rosemary and toss. Season to taste with any salt or pepper, as needed.